Turkish physician; born in 1844. He belongs to a family many members of which have been distinguished in medicine. His early studies were completed at the Jewish communal school founded at Constantinople by the Camondo family. 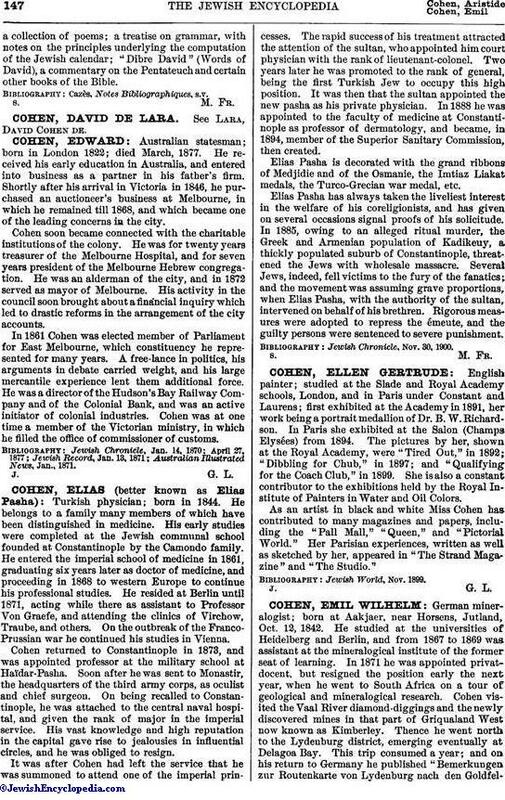 He entered the imperial school of medicine in 1861, graduating six years later as doctor of medicine, and proceeding in 1868 to western Europe to continue his professional studies. He resided at Berlin until 1871, acting while there as assistant to Professor Von Graefe, and attending the clinics of Virchow, Traube, and others. On the outbreak of the Franco-Prussian war he continued his studies in Vienna. Cohen returned to Constantinople in 1873, and was appointed professor at the military school at Haïdar-Pasha. Soon after he was sent to Monastir, the headquarters of the third army corps, as oculist and chief surgeon. On being recalled to Constantinople, he was attached to the central naval hospital, and given the rank of major in the imperial service. His vast knowledge and high reputation in the capital gave rise to jealousies in influential circles, and he was obliged to resign. It was after Cohen had left the service that he was summoned to attend one of the imperial princesses. The rapid success of his treatment attracted the attention of the sultan, who appointed him court physician with the rank of lieutenant-colonel. Two years later he was promoted to the rank of general, being the first Turkish Jew to occupy this high position. It was then that the sultan appointed the new pasha as his private physician. In 1888 he was appointed to the faculty of medicine at Constantinople as professor of dermatology, and became, in 1894, member of the Superior Sanitary Commission, then created. Elias Pasha is decorated with the grand ribbons of Medjidie and of the Osmanie, the Imtiaz Liakat medals, the Turco-Grecian war medal, etc. Elias Pasha has always taken the liveliest interest in the welfare of his coreligionists, and has given on several occasions signal proofs of his solicitude. In 1885, owing to an alleged ritual murder, the Greek and Armenian population of Kadikeuy, a thickly populated suburb of Constantinople, threatened the Jews with wholesale massacre. Several Jews, indeed, fell victims to the fury of the fanatics; and the movement was assuming grave proportions, when Elias Pasha, with the authority of the sultan, intervened on behalf of his brethren. Rigorous measures were adopted to repress the émeute, and the guilty persons were sentenced to severe punishment. Jewish Chronicle, Nov. 30, 1900.